There is a writer whose posts always catch my attention. A writer that makes you sit and take time out to get to know yourself through his own observations on life. Author Peter Wells started his blog Counting Ducks back in 2011, a friendly space, full of comfort, warmth, humour, empathy and heart. PW : I always say, by the way, that writers are people who have run out of other people to bore, so they are reduced to chatting with a blank page. AF: Very true Peter…I promise I won’t suddenly pop the telly on. So inspiration for the blog, how did it start? PW: I started the Blog with no strategy at all. I just woke up thinking one night, and thought it would be a waste not to jot those thoughts down somewhere. How I even managed to start a Blog, or choose WordPress is a mystery to me. But, I found I like formalising my odd imagination in that way, and just carried on, and gradually people started commenting and so on. AF: Yeah, it’s a bit like you enter in a search – free blog and suddenly you are inside a whole new world of possibilities and problems. I’ve read plenty of your posts, the head scratching moments you experience in life, food tales, you’re special humour, It’s a great place to get things off your chest. So, your first ideas, were they storyline based short stories, do you go back to original ones and fatten them out? PW: When I started I really had no idea what I was doing. I might talk about life and that kind of thing. If you look up a post called “We live in a house of Many Rooms” http://countingducks.wordpress.com/2011/06/14/we-live-in-a-house-of-many-rooms/ you will find me lightly philosophising with a bit of imagery, and that is really how I started. Gradually the fictional aspects became more prominent, but most of them have some point of view or nudging aspect to them. I am always looking for the insight within experience and that informs my fictional and non-fictional output. AF: One of the first things I noticed about your posts, besides your wit and charm, was the interaction from so many followers, you have a real fan base. I often see blogs that have lots of followers but they are reluctant to give thoughts and opinions. Your followers are a noisy bunch, I often think it’s this great big party that I want to be a part of. That was the appeal when I first read your work, that relaxed, openness is very seductive, oh and I got the best carrot cake recipe ever (a big call, but true) from one of your followers. Why, or do you have an inclination of why, people are drawn to your sentiment, your gentleness? PW: Firstly, if you look at the comments on my post http://countingducks.wordpress.com/?s=gap+in+the+love+chain%27, which is another story rich in common sense, you will see commentators making up puns, and even commenting on each other’s puns, which I think is a real laugh. I really do believe that understanding is much more interesting than judging, and I am much more inclined to listen than to lecture, and that possibly makes people feel safer in my company. I hate any kind of strutting, self-importance, or anything of that nature, but otherwise I am pretty inclusive. I very seldom get annoyed, and I am much more drawn to understanding than judgement. It follows that the Blog is not a threatening or opinionated place, unless you stray onto the subject of Crème Brulee or Sausages, when a different aspect of my character may surface. I may laugh at life, but I am never flippant about Crème Brulees. AF: Your passion and priorities are all in order, good to hear. 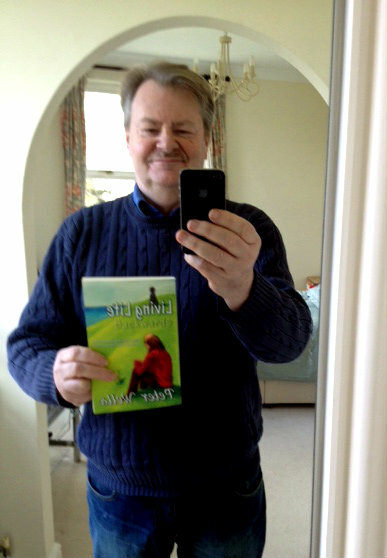 So now you have your debut novel Living Life Backwards which is an elegant read. This book is all about the characters. Their thoughts set emotional scenes in a story that celebrates the ordinary and their deeper part of their psyches, decisions and steps they take to change their lives. PW: I have always been fascinated by character and by the blend of self-determination and outside circumstances which affect it. It is the private thoughts and dreams of others which move me, rather than the size of their house, or how they compare with their peers, although that is also interesting. AF: Any seeds planted or aspects of your novel appear in any past posts from Counting Ducks? PW: I do have a fairly fertile imagination, for some reason, and these stories just pop up as I’m walking along. In some of them I can see a chance of expansion, and that is where a book might come from. Just to tell you, my next book is already being edited at the Publishers, and I am now on my third, so the words keep spilling out of me, as real life friends rush for the door, leaving me alone with the blank page. As a rule, the origin of a novel is often found in a post. This is true of Living Life Backwards, and the book I am now writing, but not of my second novel which is currently wilting under the editors knife at my publishers PDMI http://pdmipublishing.com/. Living Life Backwards or LLB came from a post about a girl whose name was so long, owing to her Dad being a hippy, that she could not get it in the passport form, ( the kind of boring but insurmountable problem which amuses me on account of a somewhat infantile sense of humour. For the book, I made the tome more serious and reflective because I can see from the ‘Like’, ‘Comment’ and reading figures which posts resonate most. AF: I suppose checking stats that way can be a useful tool, helpful with the decision of what to focus on. You want your book to have a decent readership, but you also have to enjoy writing it. I hope the next one has more of your trademark infantile humour, it’s quite endearing. It’s wonderful to see you making good ground with those blank pages. You sound like a disciplined writer, treat it like working a machine at a factory, some days the metal wheels just go round and round and other days, whirring and chugs can reveal poetry – bottom line is intention, to fight distraction. Let’s get back to your ‘gentleness’, or dare I say ‘The ordinary. It is a subject you celebrate. Characters in your book seem to have a lineage, reasons as to why they are who they are. Traits of personality discussed like eye colour, excuses for being trapped in their own…ordinariness. PW: If you work for a company, or are in the army or any situation where the leaders set the agenda of events, it follows that most of the people there are not leaders. They are just like you and me, given that you are not the secret prime minister of your state of course. I think the ‘extraordinary’ within the ordinary fascinates us all. If you can look into the heart of the most ordinary of man, with the right degree of patience and understanding, you will hear the sweetest and most enchanting music, and see paintings of similar standing. Once we start parading ourselves before each other, or showing off to gain attention, most of this music becomes inaudible, but it is there in almost any life and waiting to be heard under the right circumstances. This is the inner life in which I am interested, and it is only loosely connected, in that way with the outer life, which is often about defence/offence or conquests of one form or another. I think our personalities evolve over our lives, from external and internal reasons, and that always interests me. I am fascinated by the gap between what we think and dream and what we feel able to say. I’ve always said, and felt that within any great man are aspects of incompetence struggling to be heard, and for the more ordinary of us the percentages of bungling may be slightly higher. AF: It is more meditative, reflection, you know I read your book and felt that calm I get when I read your blog. It is like when I read an author, though not comparing, like JB Priestley – The Good Companions – It is character driven, you empathise with the vicissitudes that affect us all every day. As simple as feeling the sadness of someone drop their soup thermos at the football on a cold winter’s day. How much excitement do we need in our lives, more to life than tea and the settee. PW: Excitement is great. I love adventure and dancing and drinking too much but, out of necessity and economic limitations, most of us must live our life corralled within routines and expectations, apart from our brief holidays, and it’s the thoughts and dreams we have while in that place which intrigue me, and the way the passing of time colours them. How an event which was celebrated, for instance, may later be regarded as disastrous, or vice versa. The importance that perspective has in understanding ourselves and our world. AF: I want to talk about the ‘father’ in the your book. He is a very fascinating character. “ My father was a man of definitions, not intimacies” “Remember if you have a problem, no one else is interested, solve it yourself”, this “aping of” lack of emotion and detachment – do you find this an endearing quality or a stifling one in which you are breaking out of or just your characters? PW: The father is, to me, an interesting figure, and you may have met men like him, who are, in many ways, frightened of feelings and intimacy and prefer agendas and strategies, which can be organised without exposing yourself. Women can marry men like them and find themselves in a gilded cage, locked by diamonds but largely free from emotional warmth. Why his father was as he was could be answered, but we can all guess at it. He certainly “Didn’t go there when it came to emotions. He was only interested in what was acceptable, practical and could be replicated if you get the picture. Far inside him, for all we know, was a naked pinky thing, hanging onto the controls of his exterior abilities, as if he was driving a tank, but he would give no clues: he is far too canny and curiously timid to do that. We must remember that the father made every effort not to reveal his past and so we do not have much to go on. We can always speculate but nothing more. We have all met these buttoned down types in one degree or another. Privacy and impersonal methods of measurement and interaction are his greatest weapons, and he is unlikely to lower his barrier for our benefit. AF: Yes I suppose the lineage stopped there as he is not one to talk of unnecessary emotion. PW: No, interrupting. He would give you as little a clue as he could about why he is as he is, and would hate, for instance, for you to meet anyone who knew him as a boy who might spill some careless innocent gem about his childhood. He hates questions on that level very deeply. AF: What is he afraid of or is it just unsubstantiated guilt? PW: It can be as simple as not being comfortable with things he cannot control which, as we all know, often includes ourselves once we escape from the box. He keeps the lid down very firmly on all that. Instinctively he regards the world as hostile, and a place in which you should never lower your guard. AF: “We create our own chaos” why is that so tempting? PW: Well most ‘Gardens of Eden’ have an Apple tree. We often think, if I had one more possession I might acquire total happiness, even for a few seconds, and wouldn’t that be lovely. We can normally control these impulses towards instability, but if the Apple winks at you, life can get harder to manage. AF: the seduction of meeting people on the internet, the chaos that can possibly arise from that, the fantasy is so tempting. PW: OK, Firstly, there is a concept of being able to be totally true and open but within defined parameters. Disregarding the lies, both Bernard and Misty are Acolytes of stronger personalities whose thoughts and dreams are not as important as those of the people who control them in daily life. Suddenly with each other, they are the most important people in each others lives, without influence from outside. They can share the sweetest, gentlest connections, but always, if we look very closely, in a sort of third person. If you and I talked about a poem, and we both loved a poem deeply and in detail, we could share that, and be thinking, this is so special, to share this delicate intimacy with another, but actually it is just the poem. They love a certain kind of music, and a certain attitude to life, but the rough and tumble of daily interaction, is not known to them. For both of them, it is the first chance they have ever had to construct a love affair without being bossed around and judged by someone else, and that fact is so intoxicating, that they forget everything else. They do both discover a truth, and freedom and beauty which is breathtaking and genuine, but only partial, and only capable of being sustained under very limited circumstances. The book, in part, is about what happens when people who normally allow other more dominant or selfish characters to arrange the agenda of their lives, suddenly find themselves in a space where they can express their most inner thoughts and be heard instead of being told to “Shut up and put the kettle on “ by their more forceful companions. A whole new world, for better or worse, as we all know. Our thoughts pertained here are mere asides, as you will find out when you read Peter Wells book. Living Life Backwards studies characteristics we all know and which we all know to be ourselves – a yearning to be more then themselves. It is a most thoughtful, reassuring read about the plight of being human. 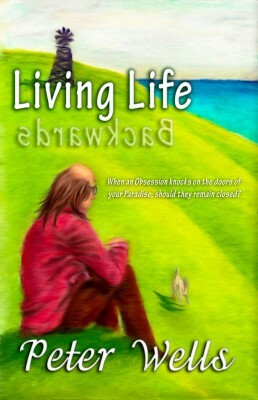 Living Life backwards is available to purchase via amazonhttp://www.amazon.com/Living-Life-Backwards-Peter-Wells/dp/1940812542/ref=sr_1_1?s=books&ie=UTF8&qid=1398418243&sr=1-1&keywords=living+life+backwards http:/http://pdmipublishing.com/books/living-life-backwards/ .